For around 12 calendar months Alfredo Morelos has been pegged as Rangers’ star player. Our best player. The potentially £20M man who the board would have to fend off a bidding war in January to hold onto. The reality is, beyond a curious £11M bid from Chinese side Beijing Renhe in January 2018, no one has actually submitted anything serious for Morelos, and discussions of his value and bid submissions have amounted to mere speculation and nothing more. Even Nice’s brief reported interest in January didn’t materialise into the alleged £8M bid being touted, and we do now wonder if Morelos is viewed outside Scotland with the same hype and attention he is in it. This is not to downplay the lad’s ability and potential; temperament notwithstanding, Morelos has the tools to be a top, top striker and one who could go in the future for the £20M ballpark many have discussed. But the (thankful) truth is the lack of hard and serious bids over summer and January have led to the conclusion that teams might not be as interested in Morelos as we think. Of course, this could be wrong – suitors could be playing their cards close to their chest. But with Morelos now confirming contentment with Glasgow and Rangers at long last, is it possible he isn’t half as close to leaving as the Scottish press would (like to) think? 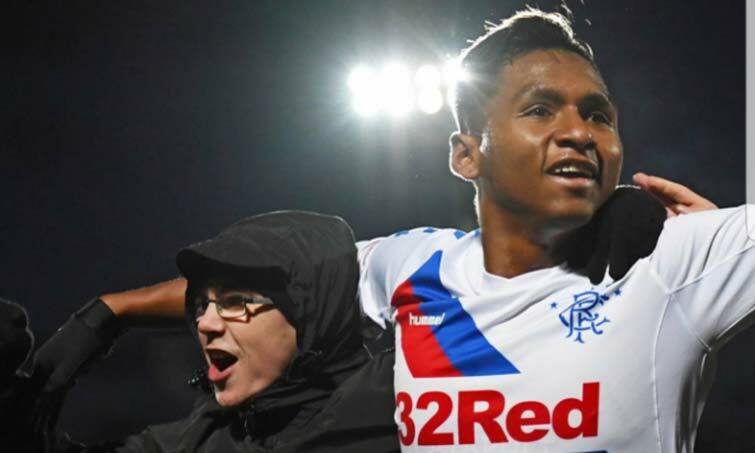 Morelos really is the ‘villain’ of the game up here, the star attraction, the focal point of the whole sport north of the border – he’s brought a small amount of that on himself, true, but equally the media and the game in general in these lands have latched onto him and created a whole soap opera around him. And yet, for all his ability, for all his goals, for all that Rangers miss him when he’s not playing – no serious bids have arrived beyond that strange one from the Far East. We have no problem with this – his recent absences from the first team through suspension have shown just how badly Rangers struggle without him. And frankly we’d rather long term this lad grows up and becomes the lethal striker he is so close to already being. His wife may have shrugged when asked if he’d still be here in five years, but frankly we didn’t even think we’d keep him the past 13 months. In fairness unless he scores goals regularly in Europe against quality sides then his achievements in Scottish football are only likely to turn the heads of EPL relegation fodder or championship clubs. To be fair it is the press who keep inventing these stories causing a twitter/blog debate about what we should accept and what we think he is worth.The only bid confirmed by the club was last seasons Chinese bid .I hope no-one does bid for him because the longer we can keep him the better. To achieve the 20m price tag, Morelos will have to score goals in the Champions League as well as burying them against Celtic! He has the stage with Rangers and hopefully he will grow with us for another year, then we might get a decent bid for him. But as it stands now, no one will pay near 20m for him. He'll need to sty at Ibrox and work on controlling his temper and banging in more goals, till summer, at least. The lack of discipline thing is, of course, an absolute nonsense. Not to mention an embarrassment to our club. The player is unlikely to be controlled in the long term, as his temperament appears to be in-built. That we continue to base our system around him is a worry, as controversy creeps up, almost on a weekly basis. Whatever the debate of his potential worth, I remain concerned more with the damage to the profile of the club, on the back of his variety of misdemeanors on the field of play, most of which cannot be justified. Ally McCoist he is not. Well said. Morelos may be good for the team at the moment, but he is not relable long term. Ally was a great player in a very very good side. Morales clearly has ability, potentially as much as. Crucially he is scoring in a pretty average team up against teams that seem to have a free pass at snipping, hacking anything in a blue shirt. Sure he has a dark side but given time and a fair crack at it he will be a star. Regrettably it wont be at Rangers. ....Buy an unknown player from abroad, get him turning in performances then sell him on. By commenting on this article on Ibroxnoise.co.uk, you confirm you have read and understood the site terms, conditions, and moderation parameters (provided on the home page) of doing so.